Continuation of ‘The Harlequin: Passage one’. It is the 30th of October, 2014. It is a Tuesday. The week has begun, progressed and is beginning to come to an end, but many people are still unable to truly relax as they can at their most beloved weekends. I woke up as normal, with a heavy head. The night before had been laden with nightmare and voices. Used to it i may be, but it is regrettably no less terrifying. Ahh yes, my nightmares. I think they have blighted my mind the majority of the time since my parents split from one another. The dreams always consist of myself sitting in a dark, dank room with grey concrete walls. I am always sitting on an old, yet ornate wooden chair. A paupers throne i suppose. Opposite me, near the wall, there are my parents committing awful, repugnant acts of homicide upon each other. These acts are repeated over and over again, until my mind is spiraling and whining. Then i spring back to the real world. The world of the awakened. I almost always awake teary and sweaty. Damn these nightmares! Each dream resided over by one abhorrent magpie. After several minutes, I ascended from my grubby bed, groaning “Bugger…” as I went, as I often did. The night before had been an arduous one to be sure. I had been on the absinthe once again with my most cherished friends. I was most certainly regretting it now, my head and gut were spinning like a carousel. My body enjoys punishing me! It revels in my pain, as if it were a self destructive torturer. As i gripped my loathsome head, I remember looking around my bedroom in a daze. Or as my brother called it my “den”. As I did, I remember thinking two distinct things. The first being how much of a dump my room was. A veritable hovel I say! As I peered around the room, I felt a feeling of belonging and homeliness. I adored my room, even if it was a tip. 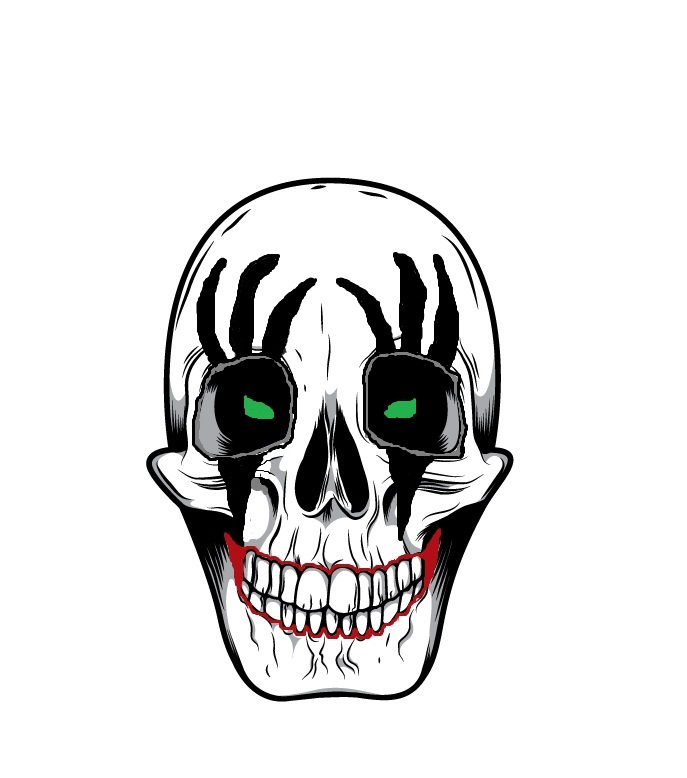 Perhaps it is a representation of myself, I’m a jester of the urban underworld after all. Hardly a high class denizen. Or so the choir of society would have you believe. Something a little different for you today. So i got a comment the other day from a fellow blogger, namely the very talented Airlia. She said she was nominating me for something called the Liebster award. Now, I’d never heard of this so i had to Google it at first. Turns out it’s not an official award but instead something akin to the old chain letter craze back from when i was young, however it is quite a bit more mature. Also nowhere near as irritating! The idea behind it is to promote each others blogs and help out the blogging community, basically. A fine goal indeed! 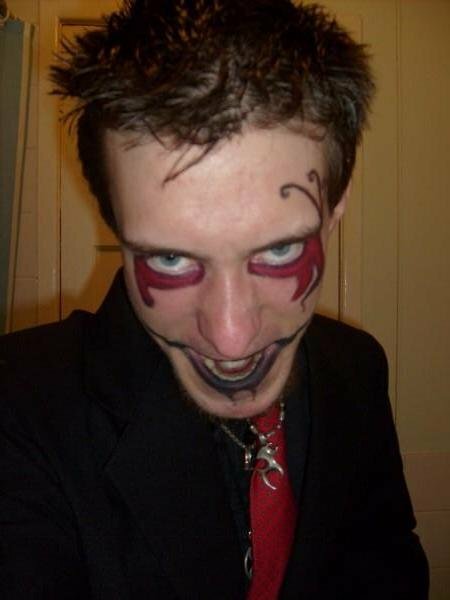 Well, as may be clear already my “name” is the Oldschool Harlequin. I’ve always shortened that as Harley in the past. I consider this blog a place (a world if you will) to spill my inner workings, however crazed or dark. So yes, thus WorldofHarley. If there was one mythical or fictional creature you’d get to keep as a pet, what would it be? I’d have to keep a little goblin as a pet. I’d call it Wallace and I would teach it to do basic housework and to greet quests. Mostly so i don’t have to. Oh, he would also wear a top hat. Just saying. Tell us your quote of the day? I’m a humble man, my biggest dream is simply to have a simple, calm life. You know, just enough money, my own place, wife. I don’t think “big” so to speak. I wouldn’t complain if i did somehow get rich or famous or whatever, but it’s not really a dream of mine. I tend to avoid dreams of wealth and grandeur. Losing all of the people in the world I care about. My family, Lee, my ‘Bruddas’ and my closest friends. I wouldn’t feel ashamed to say that would be my girlfriend Lee. She sure as hell gets me. Corny perhaps, but it’s true. If you get the chance to be a part of a different culture, which one it would be? Like another nationality? I wouldn’t mind being part of Japanese culture. It’s so different to European cultures, it would be really interesting to see these differences in action. You always hear about how strange the Japanese can be, so I’d wanna see it all in person. The Japanese have awesome television and video games too! Not sure what I’d think of the food though. If you were given the chance to travel the world, but not see or contact any family or friends during the trip. Would you go? I would have to say yes. It’s not like you’d never see your family and friends again. I would love to see the world and what better way to experience than at your own pace? 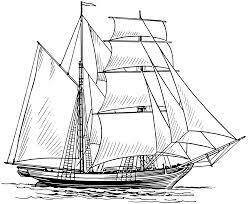 America, Caribbean, Europe, Australia, Asia, here I come! You have a magical ability or a super power, what is it and why? I would choose the ability to teleport anywhere I wanted. That would save me soooooo very much on travel expenses! You are writing your life story, what’s the first line? 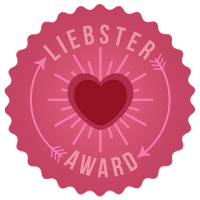 Right, so now I have to nominate 10 other bloggers to receive the Liebster award. Now, for my questions to you nominees. Mwahahahaha! OK, they won’t be that bad. 9. What is your favourite genre of music and why? Well, there we have it. That’s been a lengthy post. Again, thank you for the nomination Airlia (http://seekingsomepeace.wordpress.com/ in case you guys forgot). Thank you for reading everyone and congratulations to the nominees. Only a short one this time I’m afraid, but rest assured I am working on a couple things. This post is sort of referring back to one of my previous posts called “The Oldschool Harlequin“. It was a piece about the supernatural being called the Oldschool Harlequin, as the name suggests. In that post I mentioned the Harlequins servants. The knife, the cane, the doll and the crystal ball. Tournefoux, Domnall, Pandora and Jack Frost. These supernatural beings are powerful in their own right, each with its own abilities and nuances. 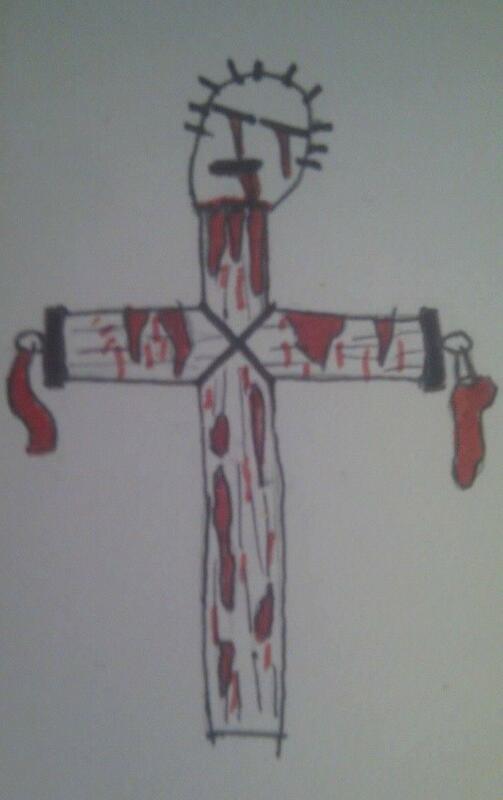 Tournefoux, for example, is obsessed with blood and relishes the spilling of it, but only if he finds the act amusing. Otherwise he regrets it utterly. 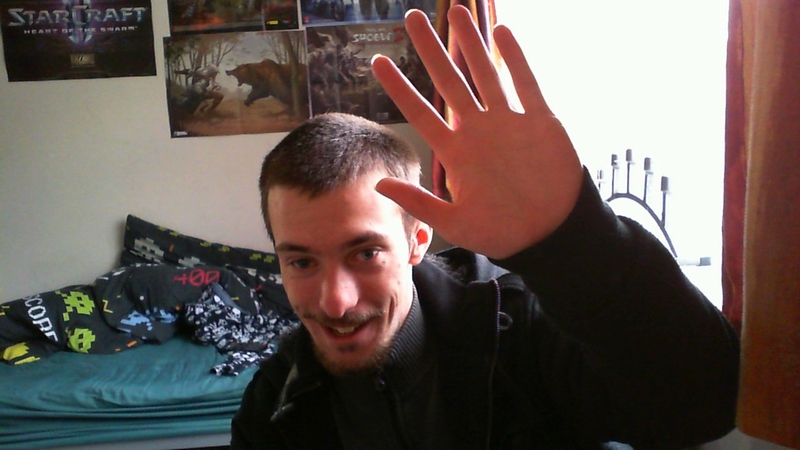 In this post, i simply wanted to show you a picture. 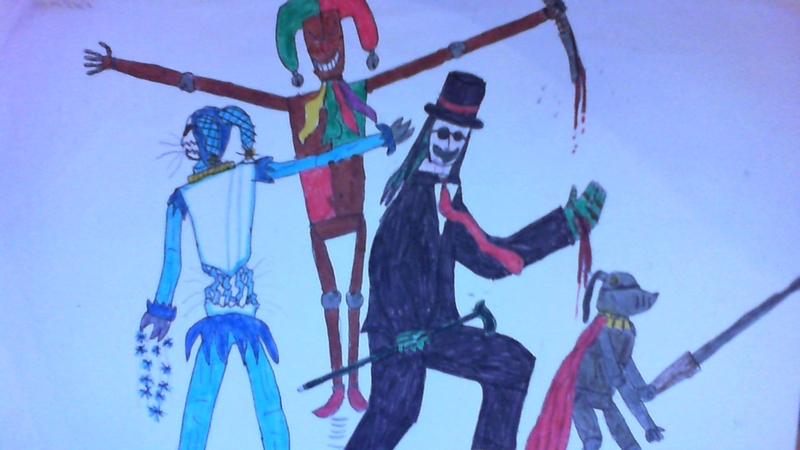 The picture depicts the Oldschool Harlequin and three of his servants: Tournefoux, Domnall and Jack Frost. At the time i drew this, i hadn’t yet come up with Pandora’s design so she is missing for now. Now, as i have said before I’m not an artist. My drawing abilities are lackluster to say the least, but i feel some kind of visual depiction is helpful in bringing the reader/witness into my world. There you have it! You will see the Oldschool Harlequin himself in the centre, with Jack Frost on the left, Domnall on the right and Tournefoux at the top. Both Tournefoux and Jack Frost resemble jesters in a fashion. Tournefoux is puppet-like with a wooden mien, here he is with his trademark knife. Jack Frost with a fairly typical icy appearance. Domnall is diminutive, with a knight-like appearance. One of his arms is like a medieval lance. These are very basic descriptions of the servants for now, I will be writing a piece about each being in the future. You may also notice the bleeding hand of the Harlequin, I will tell you now that this was not caused by any other being. The Harlequin’s hand bleeds at will, but why and how? There you go then. I wanted to post something today, but didn’t really have an actual piece of writing ready to post yet. I’ve been wanting to post this picture for a little while now anyway, so I thought now was as good a time as any. 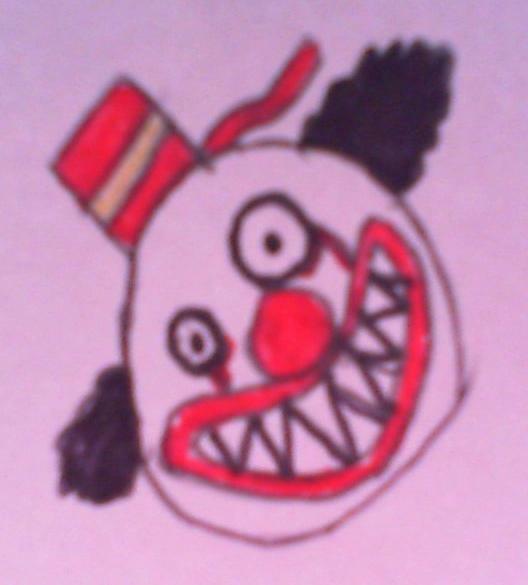 I hope you like it despite my lack of drawing ability. Until next time, have a crazy day! 3Ib of the so-called Human condition. 1oz of doomed high spirits. 2 pints of perpetual envy. 2oz of ill-fated and untoward romance. 7oz of laughable piety, at room temperature. 1 pint of ruthless greed. 1Ib of the desire to destroy, at room temperature. 31/2 pints of spilled blood. Leave for approximately nine months. And there you have it, a recipe for disaster. With our sermons and invocations we manufactured them. We brought them into being. We are both order and chaos incarnate. I just want to take a minute to wish my most lovely girlfriend Lee a very happy birthday! You are an inspiration to me. It is time for part three of the Harlequins writing music thingamajig (That’s a technical term you know…). It’s getting to the point now where it almost seems like this is a favourite song list, but i assure you it is not. While I do love all of these songs, I have not included my favourite songs simply because they are not part of my writing music. There is a difference, believe it or not. Join me once again as we delve into the minds of marvelous artists the world over. And there we are! Another edition of the Harlequins writing music for your viewing and listening pleasure! Once again, quite a bit of variety eh? Variety is the spice of the mind, as well as life i suppose. Check back soon for part 4! And from that, came Rage burning. Or everything all at once? You feel concoctions, rather than emotions. And topped off with some loneliness. Who knows what the reaction could be. Who knows what the catalyst is. To be insane is to be both a loose cannon and a straight arrow. Isn’t one the most human of us all? Or is one the least feeling of us all? Could the most insane also be the most sane? What will we do with a lively sailor? What will we do with a broken sailor?